As a Makeup artist, palettes are my best friend, lots of shiny options all in one place. I can often be found in my kitchen melting plastic packaging of eyeshadow & blusher compacts to make up my own pallets. So when I find a great ready made pallet I get very excited! I have put together 5 of my fav luxury eyeshadows pallets for your drooling pleasure. With, dare I say it, Christmas around the corner, ekk! You will want one of these baby’s on your wish list! 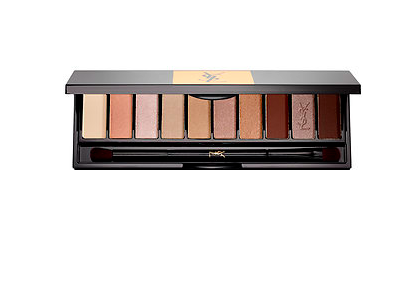 1 – Yves Saint Laurent – Couture Variation 10 Color Eye Palette in NU. This is a beautiful fairly natural palette, Perfect for day time looks also great for bridal makeup. The colour payoff is good, it’s not too heavily pigmented, so it’s great those who are not so confident with eyeshadows. It come with three light shades, three medium shades, & three dark shades, so you can easily go from day to night makeup. Excellent for fair skin tones, blondes & redheads & those with blue & Hazel eyes. This is such a pretty pallet, perfect for olive skins & brown/hazel eyes, the greens add a playful touch – perfect as we come into the summer months! I would use the pearly white as a highlighter under the brow bone & in the inner corner of the eye & then choose either the soft warm or pale pink as your main colour on the mobile lid, smoking it out in the outer corners of the eye with the gold or the dark mossygreen. These beauties can be use dry for a lighter application or you can dampen your brush & apply wet for a more intense look! Who doesn’t love Chanel Makeup! you are definitely paying for a superior product here at around $80 for this pallet you would expect it to turn you into a Victoria Secrets model! The satin – matte textures blend effortlessly into each other & onto your skin. These autumnal colours are perfect for all year round & they suit every skin tone. In my opinion you can’t go wrong with a gold smokey eye! Warmmuted tones infused with shimmering hues of gold, bronze or copper this pallet really is to die for! IN LOVE! I love a bit of TF! My shade & illuminate is one of my fav products. This awesome compact doesn’t disappoint either. Eyes & cheeks together – err winning!! This pallet is a great one to take on holiday if you want to pack light, the blushers are stunning, great colour pay off! Use the light peachy/pink tone on the cheeks to lift & brighten – great for daytime, the darker plummy pink blush is great for an evening look – also gorgeous on olive & darker skin tones. Darker skin tones can also use the lighter blush as a highlighter for the cheeks. The lightest eyeshadow is great for highlighting the eye (brow bone & inner corners) The shimmery gold colour looks gorgeous pressed onto the centre of the lid, use alone or with the darker plummy eyeshadow for a smoked out smouldering look! Died & gone to makeup heaven! Save the best till last! These carefully chosen rich smokey shadows are a dream to apply, butter like consistency allows for impeccable blending, the colour payoff is fantastic & true to colour. There is someone for everyone here. Again you can take your makeup from day to night layering up the shadows to amp up the drama.